Sure, the Spanish pitcher drink named for its blood-like color is traditionally made with red wine, but who says you can’t mess with tradition? Here are seven different takes from top chefs and mixologists. 1. For when you want it to pack a punch. New York’s Tabla restaurant may be no longer, but the fantastic sangria recipe lives on. When you want a boozy drink to serve a crowd, make this red and white wine sangria made with orange liqueur, gin, rum and brandy. 2. For serving with spicy food. Even when they come from a can, lychees are wonderfully fragrant and pair nicely with spicy food. Make this lychee-sweetened white wine sangria from Shinsei in Dallas or be like Bill Kim in Chicago and get more specific, using Riesling (a notoriously Asian-food-friendly wine) in your drink. If you want a sangria that’s more about the flavor of the fruit, make it with exclusively sake. 3. For when you want to pretend sangria is healthy. If you pump the pitcher with antioxidants, it’s good for you, right? Chef Kerry Simon uses pomegranate juice and green-tea-infused vodka in his complex sangria. 4. For when you want to show people that white sangria can be as good as red. Make a serious white wine sangria by adding fresh orange juice and brandy, as chefs Amanda Lydon and Gabriel Frasca did. 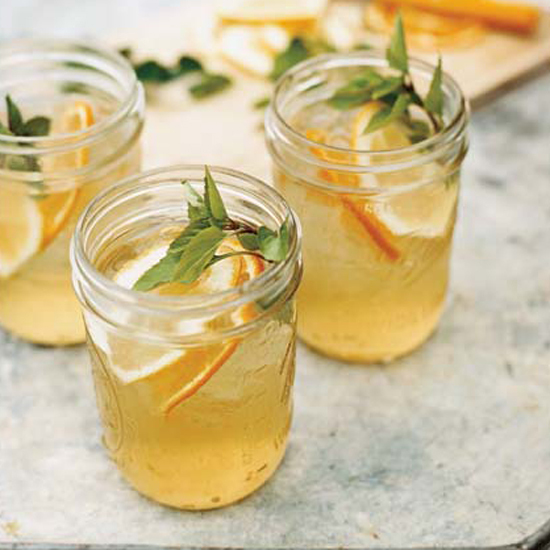 Top it off with a sprig of anise-y Thai basil, and you may never make a classic sangria again. 6. For when you want a little more party. That’s right—according to mixologist Adam Seger, you can put all of the typical sangria ingredients in a blender with some ice and turn this pitcher drink into a slushie. 7. For when you want something less boozy. Need a drink that will refresh you on a sweltering summer day? Make your sangria with wine and juice only, adding a cinnamon syrup to keep things interesting.